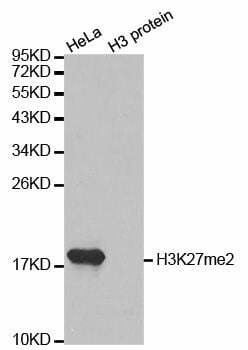 Small volumes of anti-H3K27me2 antibody vial(s) may occasionally become entrapped in the seal of the product vial during shipment and storage. If necessary, briefly centrifuge the vial on a tabletop centrifuge to dislodge any liquid in the container`s cap. Certain products may require to ship with dry ice and additional dry ice fee may apply. Histones are basic nuclear proteins that are responsible for the nucleosome structure of the chromosomal fiber in eukaryotes. Nucleosomes consist of approximately 146 bp of DNA wrapped around a histone octamer composed of pairs of each of the four core histones (H2A, H2B, H3, and H4). The chromatin fiber is further compacted through the interaction of a linker histone, H1, with the DNA between the nucleosomes to form higher order chromatin structures. 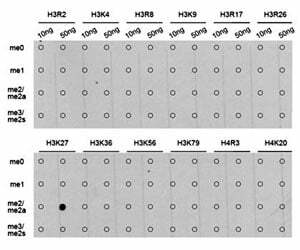 This gene is intronless and encodes a replication-dependent histone that is a member of the histone H3 family. Transcripts from this gene lack polyA tails; instead, they contain a palindromic termination element. This gene is located separately from the other H3 genes that are in the histone gene cluster on chromosome 6p22-p21.3. Western blot analysis of extracts of various cell lines, using DiMethyl-Histone H3-K27 antibody. 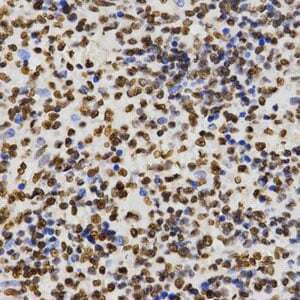 Dot-blot analysis of all sorts of methylation peptides using DiMethyl-Histone H3-K27 antibody at 1:1000 dilution. 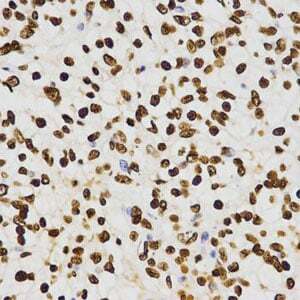 Immunohistochemistry of paraffin-embedded rat lung using DiMethyl-Histone H3-K27 antibody at dilution of 1:200 (40x lens). 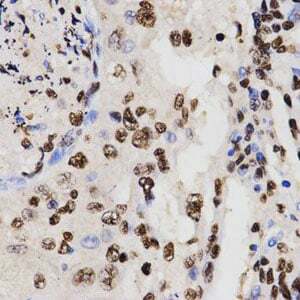 Immunohistochemistry of paraffin-embedded human kidney using DiMethyl-Histone H3-K27 antibody at dilution of 1:200 (40x lens). 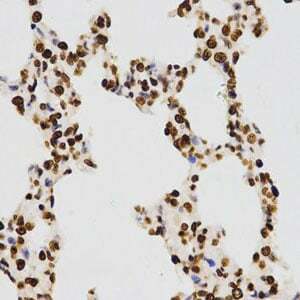 Immunohistochemistry of paraffin-embedded human lung cancer using DiMethyl-Histone H3-K27 antibody at dilution of 1:200 (40x lens). 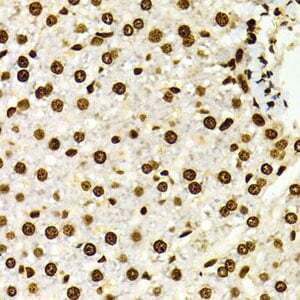 Immunohistochemistry of paraffin-embedded human liver cancer using DiMethyl-Histone H3-K27 antibody at dilution of 1:200 (40x lens). 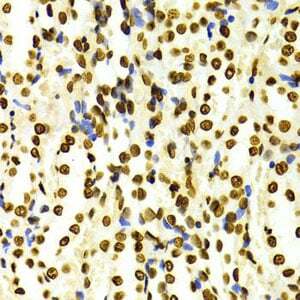 Immunohistochemistry of paraffin-embedded Mouse heart using DiMethyl-Histone H3-K27 antibody at dilution of 1:100 (40x lens). 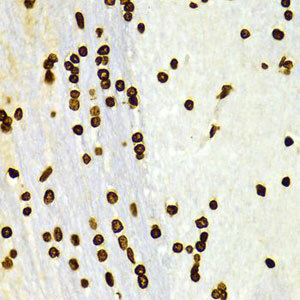 Immunohistochemistry of paraffin-embedded Mouse kidney using DiMethyl-Histone H3-K27 antibody at dilution of 1:100 (40x lens). 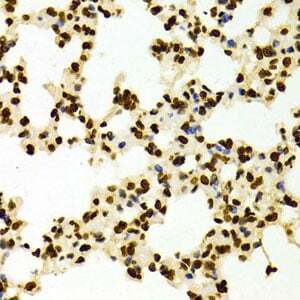 Immunohistochemistry of paraffin-embedded Mouse lung using DiMethyl-Histone H3-K27 antibody at dilution of 1:100 (40x lens). 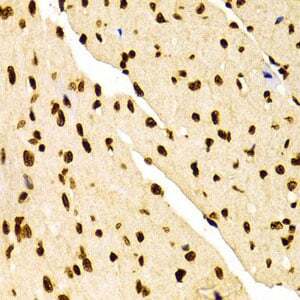 Immunohistochemistry of paraffin-embedded Rat brain using DiMethyl-Histone H3-K27 antibody(MBS126234) atdilution of 1:100 (40x lens). Immunohistochemistry of paraffin-embedded Rat kidney using DiMethyl-Histone H3-K27 antibody (MBS126234) at dilution of 1:100 (40x lens). 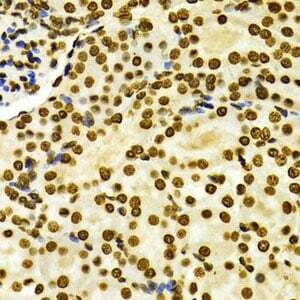 Immunohistochemistry of paraffin-embedded Rat liver using DiMethyl-Histone H3-K27 antibody (MBS126234) atdilution of 1:100 (40x lens). Immunofluorescence analysis of 293T cells using DiMethyl-Histone H3-K27 antibody (MBS126234).Blue: DAPI for nuclear staining. 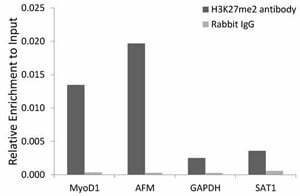 Chromatin immunoprecipitation analysis extracts of 293 cell line, using DiMethylHistone H3-K27 antibody (MBS126234) and rabbit igG . The amount of immunoprecipitated DNA was checked by quantitative PCR. Histogram was constructed by the ratios of the immunoprecipitated DNA to the input. NCBI/Uniprot data below describe general gene information for H3K27me2. It may not necessarily be applicable to this product.